Murielle Bourdon was born in Longueuil, in the province of Quebec in Canada. She is mother of three young adults. Since her early childhood she developed a passion for reading, writing short stories and poems, including drawing. Secretary for more than 15 years, she decided in 1996 to change her careers towards creativity and what fascinates her: art and writing. She returned to school and received a bachelor degree in graphic design. In 17 years, her remarkable artistry creates outstanding achievement for a variety of customers. At the beginning of 2014 Murielle decides to realize a dream which she secretly had harbored since her young age, and devotes herself to writing and illustration. By creating a collection of children's books, she wants to share the real and imaginary world which is in her, with young readers. Jeremy is an eight-year-old boy who loves his parents, Grandpa Eugene, and school. One day while in school, Jeremy was told the tragic news that his parents, Jim and Molly, had passed away after they were involved in a car accident. Jeremy is devastated, but carries on for his grandfather's sake. Grandpa Eugene becomes ill and Jeremy has no time for friends or other fun things in life because he has to take care of his grandpa. Jeremy was sad, frustrated, and lonely when Christmas time came around and his grandpa was still ill. How can Jeremy get through this difficult time without his mother and father, and his grandfather being sick, and to top it off ... no Christmas presents this year! Will this Christmas be a sad and lonely one? Sami The Magic Bear: The Best Christmas Present Ever! by Murielle Bourdon is book one in the Sami The Magic Bear series, offering young readers an introduction to the concept of grieving, loneliness, a variety of emotions, as well as a bit of magic. It is often very hard for anyone to lose a parent, let alone a child as young as eight. The author creatively portrays what a boy that age might be feeling, and the actions they might take within the main character, Jeremy. Christmas is hard enough for a young person to handle without their parents, and is even harder if a loved one is sick. Within the story, the author conveys a young child's grief and emotion as he realizes this Christmas isn't going to be a happy one without his parents, and his grandfather being sick. When all seems lost, Jeremy receives a surprise from his parents; Sami the Magic Bear. Sami is a wonderful present, someone for Jeremy to love and confide in. Children often don't know how to express themselves to adults when in a situation that involves a deep emotion. Having a best friend, toy, pet, or in this case a stuffed animal friend to talk to can make it easier. Sami The Magic Bear: The Best Christmas Present Ever! is uniquely created to help young readers cope with loss and the grief that comes with it. Children, parents, and teachers alike can use this book as a useful guide during a similar situation they themselves are going through, or someone they know. Sami The Magic Bear: The Best Christmas Present Ever! is Book One of The SAMI Collection, written and illustrated by Murielle Bourdon. Jeremy was a happy kid who loved his parents and grandfather. He did well in school when he wasn't daydreaming, which he liked to do, a lot. One day, his grandfather came to school to tell him that his parents had died in a car crash. From then on, Jeremy lived with his grandfather in the house where he grew up. He'd remember the fun things he did with his parents and was sad at times because he missed them. Things got even more difficult for Jeremy when his grandfather became ill. Jeremy had to both take care of him and go to school, and he hated leaving his grandfather alone when he was sick. When the Christmas season approached, Jeremy thought of how wonderful Christmas used to be, but he felt little hope for a happy Christmas this year. Then, on Christmas Eve, he saw a brilliant light in the sky, and everything changed. 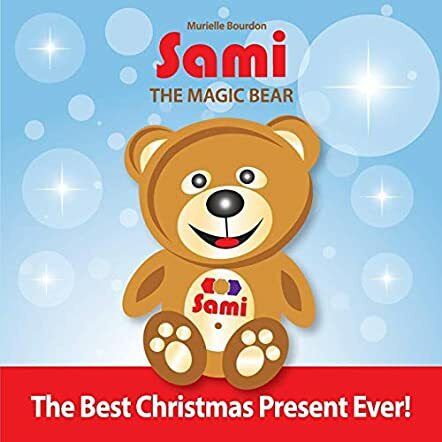 Murielle Bourdon's children's story book, Sami The Magic Bear: The Best Christmas Present Ever!, introduces the serious subject of loss to children in a compassionate and caring way. Jeremy's carefree childhood seems to have abruptly ended with the loss of his parents, and his grandfather's illness makes him feel totally alone and very insecure. Jeremy's Christmas Eve visit with his parents is beautifully described, and his excitement at finding their present turns the somewhat somber tone of the story right around. Bourdon's brightly colored illustrations work quite well with the story. She gives each character expressions that clearly show their personalities and emotional states. I enjoyed reading Sami The Magic Bear: The Best Christmas Present Ever!. While the subject matter may require some extra care in sharing this with younger children, the presentation and gist of the book makes it work very well. It's highly recommended. Sami The Magic Bear: The Best Christmas Present Ever! by Murielle Bourdon is a magical children’s story created especially for kids struggling with difficult times. Jeremy is an eight-year-old child who loses both his parents in a car accident. All he has left is his Grandpa Eugene and the memories of his father, Jim, and mother, Molly. As he is struggling with the deaths of his parents, he faces another blow as his grandfather falls sick. With no one to turn to, he dreams often and dreams of his parents. One night, as his grandfather lies ill, he calls out to his parents in desperation and believes that his parents come to him and give him a wrapped Christmas present. The next morning, he wonders if he dreamt it all, but soon finds out the present is real and is a toy bear named Sami. However, Sami is no ordinary teddy bear and can walk and talk. This is a story of hope for a young boy and how Sami the bear helps him during his trying times. Sami The Magic Bear: The Best Christmas Present Ever! by Murielle Bourdon is a short story that is meant to help and inspire kids of all ages who are in need of a friend, especially during troubling times. The themes of parental death as well as hope and love are what make up the crux of the story. Sami The Magic Bear: The Best Christmas Present Ever! is written in simple language and the illustrations are well drawn and complement the book. Overall, this is an interesting and perhaps inspiring read for young children. Jeremy is a very sad little boy. He's been living with his grandfather for a few months and going to school nearby. One day his grandfather appears at the school with the sad news that Jeremy's parents had been killed in a car accident. Now it is just Jeremy and his grandfather. Only his grandfather is now terribly sick and Jeremy has to take care of him all by himself. Christmas is coming and there will be no presents, just more caring for a sick grandfather. Jeremy cries a lot. He even visits his parents' grave on the way to school, crying all the way. On Christmas Eve, Jeremy is still sad as his grandfather is still very sick. He has a dream that his parents visit him and bring him a gift of a magical teddy bear, Sami. The gift lightens Jeremy's mood and helps him deal with his grief. The next morning, Christmas morning, Jeremy's grandfather is better and is even making a special breakfast for the two of them. Murielle Bourdon has written another charming story with colorful illustrations in Sami The Magic Bear: The Best Christmas Present Ever!. Sami is a magical bear that reaches out to help children with many different problems. In this story, Sami helps a boy deal with his grief over losing his parents. Every child has problems from time to time. They always need someone or something to talk to, to share their problems with. That's where Sami comes in. This is an inspiring magical bear story that helps children going through difficult and sad times. Well done! Jeremy lives alone with his grandfather. His parents, Jim and Molly, had died in a car accident, but Jeremy is a courageous boy who still manages to be grateful for the happy moments in his life. However, when his grandfather falls sick and is in bed for weeks, the thought of losing his grandfather and being completely alone breaks his heart. When his grandfather is still sick in bed on the morning of Christmas Eve, Jeremy sadly thinks that there won’t be a Christmas to celebrate. Sami The Magic Bear: The Best Christmas Present Ever! by Murielle Bourdon is Book 1 from the Sami collection. With the vivid illustrations done by Bourdon herself, the story is written in an easy way that children will definitely comprehend and acknowledge. Yet the simplicity tackles difficult and complex matters such as death, sadness, fear and loneliness. Bourdon encourages the idea that love, hope and happiness are never gone. Jeremy receives a special gift on the night of Christmas Eve; Sami the magic bear. On the whole, it’s an appropriately melancholy tale, with the promise that wonderful things still lie ahead in life. It’s an appropriate way to nurture not only hope, but also resilience in young minds. This book is a great medium to be used by parents and educators to engage in difficult issues with children that are already intrigued by the facts of life, whether they have or haven’t started to read independently. Bourdon’s Sami collection is definitely a great series for young readers.